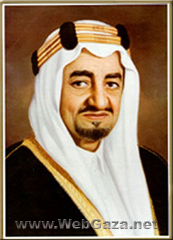 King Faisal bin Abdul Aziz - Who is King Faisal? Faisal bin Abdul Aziz was born in 1906 in Riyadh, the third son of a reigning monarch; five years after his father had captured Riyadh. Faisal’s grandfather, Abd al-Rahman, had lost this government seat in 1890 to Ibn al-Rashid, the chief of a rival house, and had be­gun to reestablish Saudi rule in central Arabia. Faisal’s career coincided with the rise of the modern Saudi state, and the experience he gained under his father's benevolent rule proved invaluable for the responsibility that eventually fell up­on him. Two significant events had far-reaching effects on both his early upbringing and his public life. The first was the premature death of his eldest brother Turki, (1901 -1918) just when he had begun to exercise some authority delegated to him. Sa'ud, the next son, born in 1902, did not have the necessary characteristics of a leader. The second event was his mother's early death, which brought Faisal under the care of his maternal grandfather. This grandfather was known for his piety and learning and was a descendant of Sheikh Muhammad bin Abd al-Wahhab, a Muslim reformer and founder of the Wahhabi order, who had entered into an alliance with the founder of the Sa'udi dynasty. Faisal grew up learning to recite the Qur’an, and he studied the hadith, the Prophet's Traditions. He also read Arabic literature and composed poetry. As a child he accompanied his father and learned a lot the later aided him in public life. Remarks about men and public affairs opened his eyes, and he learned the manners of great men, patience, self-possession, and the ability to handle people, from associating with his father. Faisal was given his first official duty a year after the end of World War I, at the age of thirteen. King Abd al-Aziz was invited to London to discuss border questions that had arisen between him and King Husain, ruler of the Hijaz and an ally of Britain in the war. The king was not well and he sent his son Faisal to represent him as head of a delegation. King Abd al-’Aziz appointed Ahmad al-Thunayyan, who had traveled abroad before and spoke French and Turkish, to accompany his young son. The announced object of the mission was to offer Ibn Sa'ud's congratulations on the victory of the Allies in the war, and Faisal, in an audience with the King, presented two swords and a letter from his father. He discussed political questions with the British Foreign Secretary Lord Curzon. No agreement on the border dis­pute was reached; but Ahmad al-Thunayyan promised on behalf of his master that "there shall be no war for three years." Before his return, Faisal met in London and Paris with high officials concerned with Arabia and learned at first hand some realities about foreign affairs. Faisal bin Abdul Aziz learned about military operations on his next assignment in 1922 at the age of 16. He was appointed to command a force sent to 'Asir, a territory between the Hijaz and Yemen. ‘Asir was under the rule of the 'Ayid dynasty and was disputed between the rulers of Najd and the Hijaz. Faisal’s mission was to support tribal chiefs who owed allegiance to Ibn Sa'ud and who were opposed to 'Ayid rule. In 1923, the entire territory came under Saudi control, and it was incorporated into Ibn Sa'ud's kingdom in 1930. Faisal was a military commander again in 1934, fighting off a Yemeni attack on a region considered to be within Saudi territory. The King of the Yemen appealed for peace when he lost the territory, and Faisal was instructed to withdraw from land he had won in the battle. In 1962 when civil war broke out in Yemen, the government of Yemen appealed for support from Saudi Arabia. In both 'Asir and Yemen, Faisal gained invaluable experience in war and diplomacy. The annexation of the Hijaz in 1925, without fully incorporating it under Ibn Sa'ud's administrative system, left the country's highest political post vacant after the abdication of the King of the Hijaz. Ibn Sa'ud appointed Faisal administrative Viceroy of the Hijaz in 1926, a position he held for over thirty years. When a Ministry of Foreign Affairs was created in 1931, Faisal was appointed Foreign Minister. He resided in Mecca, the country's holy capital, and traveled to Jeddah, a more cosmopolitan center, to receive heads of foreign diplomatic missions. He traveled to Europe (in 1926, 1932, and 1939), including an of­ficial visit to the Soviet Union. By World War II he had been to almost all important regions of the world. Other ministries he was appointed to: Finance in 1932, Defense in 1944, and Interior in 1955. In 1945, Faisal bin Abdul Aziz represented Saudi Arabia at the United Nations Conference. 1. The government is prepared to develop the community educationally, culturally and socially so that it might reach the level that would be truly represented in the form of a unified system of government calculated to achieve the ideals embodied in the sacred law (shari 'a). . . . It is believed that the time has come for the promulgation of a Fundamental Law for the Government' drawn from the Qur'an and the Prophet's Traditions and the conduct of the Orthodox Caliphs that will set forth explicitly, the fundamental principles of government and … the basic rights of citizens, including the right to free expression of opinion within the limits of Islam and public policy. 2. The Government will also undertake to draw up legislation that will regulate local government in the provinces in order to improve the administrative system and achieve political and social development. 3. The Judiciary shall enjoy immunity and respect. . . . To achieve this purpose, a Ministry of Justice will be created to' supervise the administrative affairs of the Judiciary and a Public Prosecutor to protect the individual's rights and interests. 4. Since the texts of the Qur'an and Traditions are fixed, and the country's conditions are changing, it is imperative to consider important matters of state in the light of these changes and in accordance with the sacred law. For this purpose it he been decided to create a Judicial Council consisting of twelve members chosen from well-known jurists and 'ulama and whose functions will be advisory on all matters referred to it by the state or individuals. 5. The Government will continue its duties to uphold the principles of Islam, spread its call and protect it by word and by deed. 6. In order to achieve these duties, the Government has decided to reform the Committee for Public Morality, designed for moral guidance, so as to conform to the goals for which it was created. 7. One of the Government's most important functions is to raise the nation's social level. It has therefore decided to con­tinue its work to provide free medical treatment and education at all levels. Social security, for which regulations have just been issued, will provide support for the aged, disabled, orphans and women without means for livelihood. Soon all the needy will have similar support as well as unemployed workers. 8. The Government will issue laws which will regulate the economic and social development in accordance with the coun­try's needs and aspirations. 9. The financial and economic developments are the Government's prime concern at the present. Reform programs will be laid down to encourage initiative and private enterprise, to raise the standard of living, and to improve communications and transportations. Studies of water resources for drinking and agricultural purposes will be undertaken. It is hoped that Saudi Arabia will soon become an industrial and agriculturally self sufficient country possessing adequate sources of revenue. An industrial and an agricultural bank will soon be established as well as the General Petroleum and Mineral Agency. These and other agencies will undertake to develop the country's resources and exploit its minerals and other riches. 10. Slavery is absolutely prohibited and penalty will be im­posed on those who are still engaged in this traffic. Faisal maintained that each Arab country should be fully sovereign and no country should interfere in the domestic affairs or the political system of another. He considered it Egypt's business whether a republican system was adopted when the monarchy was overthrown in 1952, and he maintained friendly relations with Nasser. When the monarchy in Iraq ­was overthrown in a military uprising in 1958, Faisal's government waited a week to recognize the republican regime, while Egypt and some other Arab countries extended immediate recognition. But when the revolt in Yemen in 1962 failed to remove royal rule, and Egypt sent a force to help Yemeni republicans against royalists, Faisal protested on the ground that the choice of government was the privilege of the Yemeni people. When Nasser con­tinued to help the Yemeni republicans, Faisal came to the support of the royalists, and the civil war continued until the Arab-Israeli war of 1967. As a positive step to counteract the spread of revolutionary ideas, Faisal suggested a policy of Islamic "solidarity". He called on Arab and Muslim heads of state to cooperate on a regional basis to protect their independence and territorial integrity and oppose any form of foreign intervention. When Egypt, Syria, and Jordan were attacked by Israel in 1967, Saudi Arabia gave these countries political and material assistance. In 1969 when the Aqsa Mosque in Jerusalem was partially destroyed by fire, he called an Islamic summit conference at which a resolution censuring Israel for failure to protect Islamic sacred shrines was adopted, as Jerusalem is second only to Mecca and Medina in its significant to Islam. With oil production and an improved financial situation in the kingdom, Faisal was able to pursue various reforms and modernization projects. Several universities were established or expanded during his rule, and he continued to send a great number of students to study abroad. Faisal followed his father’s example of accessibility by maintaining a majlis, where his countrymen could discuss their problems or petition the King. On March 25, 1975, Faisal was shot at point blank and killed at a majlis by his half brother's son Faisal bin Musad.